Pheno Forecast maps estimates when insect pests and invasive species will be in their vulnerable stages. 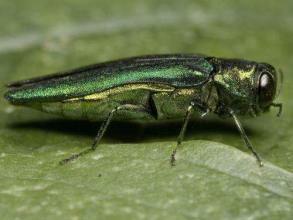 For example, for emerald ash borer, the maps forecast when emerging adults will be present. 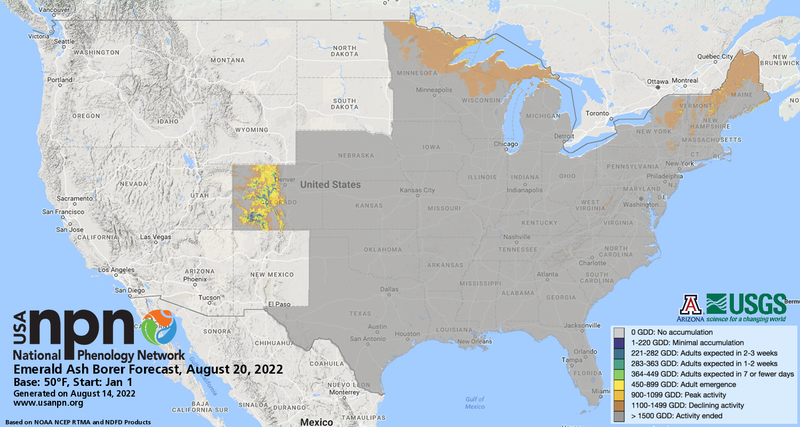 The USA-NPN Pheno Forecasts can help you determine when insect pests and invasive species will be found in your region at life stages critical for monitoring and management. Download the Pheno Forecast information sheet to learn more. Help us improve these maps! Our Pheno Forecast map products are still in development, and we seek input on their performance in your area. Give your feedback on these products. Are you concerned about pests damaging your plants? These maps will help you determine when your site will reach critical heat accumulation for the detection, management, and treatment of insect pests. Maps are available via the USA-NPN visualization tool and on the individual species landing pages below. Insect pest forecasts are based on USA-NPN Accumulated Growing Degree Day (AGDD) map products and published GDD thresholds. References for the published thresholds used to generate the forecasts appear on the individual species pages. The invasive buffelgrass forecast is coming soon and will be based on rainfall accumulation thresholds that are known to trigger green-up to optimize treatment and control. These maps are intended to provide a broad-scale prediction regarding when management action may be necessary and are intended to supplement local knowledge. Forecast accuracy may vary locally based on microclimatic variation. In addition, thresholds may perform with variable accuracy across species ranges. For more information about these pests and others, specific to your state, contact your local Cooperative Extension program. We invite your feedback on the performance of these forecasts at your location. You can help us improve the accuracy of these forecasts by letting us know when invasive and pest species undergo life cycle stages at your location. You can report observations of all Pheno forecast species in Nature's Notebook via the Pest Patrol campaign. Content, maps, and data accessible via usanpn.org are openly and universally available to all users. USA-NPN is not responsible for the content or the use of the data. Content may be re-used and modified with appropriate attribution (e.g., "source: USA National Phenology Network, www.usanpn.org"; see our complete Content Policy). See our Data Use Policy for suggested citation and attribution of the underlying data products.